Units A3 and A4 will discuss some of the major ways in which paintings convey depth, representing three-dimensional objects and spaces on a flat surface. Whereas unit 4 will consider the notion of "modelling", this unit discusses perspective. We begin in section a by considering linear perspective. In section b we then discuss the notion of aerial perspective. In section c we consider the techniques of "empirical perspective". In section d we consider the importance of "point of view" in perspective. Finally, in section e we discuss some of the ways in which paintings can resist strict linear perspective. Perspective is one of the most central techniques in paintings which aim to create an illusion of reality: it is a means by which the relative distance of objects is conveyed, so that a flat, two-dimensional canvas appears to open up into three dimensions. (The other major means by which this occurs, modeling, is discussed in Unit 4.) Perspective, however, should not be considered as a single technique: there are numerous ways in which artists use perspective, some of which we'll discuss in this unit. Perspective is one of those instances where we are very tempted to think of "advances" in techniques in the visual arts: as though paintings which do not make a convincing use of perspective are in some way inferior to those which do. But we need to be very cautious in talking of the development of perspective as a straightforward "advance". Often when I do a class on perspective, and, having looked at examples of medieval art, we finally arrive at some of the paintings of the Renaissance, there is a sense of relief in the room: as though artists finally "got the hang" of perspective. 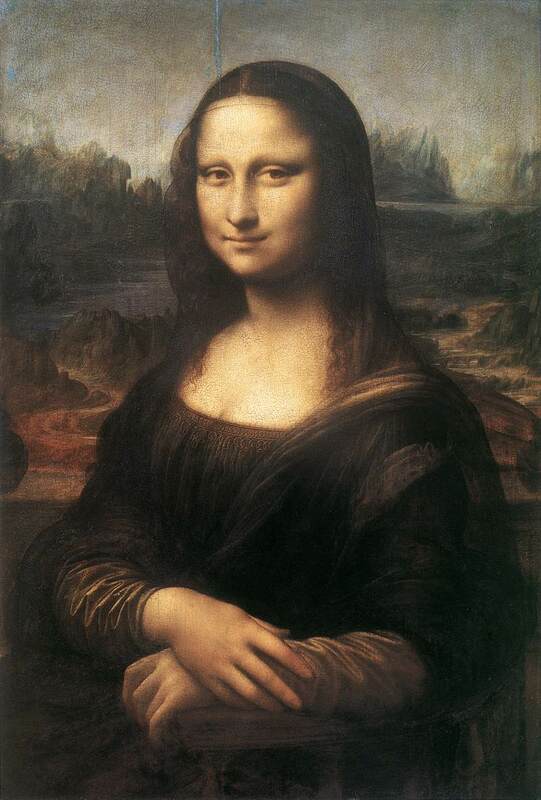 But let's remember from the very beginning that in many ways, it suited artists before the Renaissance quite nicely not to use perspective; and, moreover, a questioning of perspective has helped lead to some of the most interesting and important developments of modern art. We'll consider the use of non-perspectival art in section (d) of this unit. Two thoughts, then, before we begin: first, there are many types of perspective; secondly, we need to remember that, just because there appears to be a scientifically "correct" way of depicting perspective, we shouldn't automatically judge works which do not apply that "correct" perspective as "worse" than those which do. For most people today, the idea of perspective is closely linked with linear perspective. The phrase "linear perspective" refers to a particular way of depicting the ways in which objects far from us appear smaller than those near to us. Linear perspective was developed in the Italian Renaissance, was first used by the Florentine artist Masaccio, and was initially theorized by Brunelleschi. An essential element for centralized perspective is a "horizon line": an imaginary line at the eyeline of the viewer, at the centre of which all the orthogonal lines, the diagonal lines of objects receding into the distance, converge. This point of convergence is known as the "vanishing point". This creates the impression that you are looking through the surface of the picture, as though through a window. We all have experience of this: for example, if you stand in the middle of a long, straight road and look down it, the sides of the road (marking the orthogonal lines) appear to get closer together and eventually meet in the centre. A good example of how perspective is worked out is Leonardo da Vinci's Perspective Study for the Adoration of the Magi (1481-82): click here (external link; Dartmouth College). In art, this technique works especially well with cityscapes: for the clear lines of buildings can be made to fit very easily, and indeed match the orthogonals. 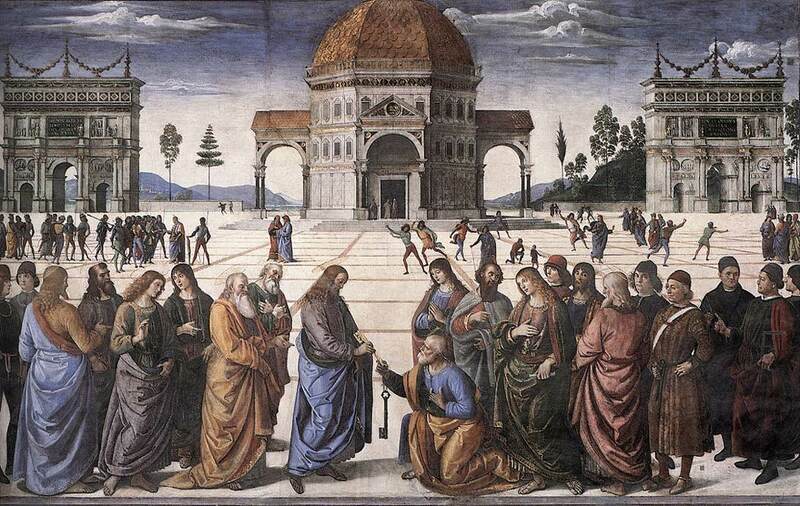 Often we are led into the scene by decorative schemes, such as in the case of Perugino's Delivery of the Keys to St Peter (1482): click here (external link; Web Gallery of Art). Here, an extremely clear geometric scheme is marked out by the tiling on the ground, which indicate the orthogonal lines, pointing towards a vanishing point in the distance; and there are three groupings of people: those in the foreground, who are to be the focus of our attention; those in the middle ground, who are proportionately smaller; and a few figures in the background, who are still smaller again. Thus the illusion of space is attained by Perugino using a very clearly marked out scheme of linear perspective. The use of perspective is not always mapped out as clearly as in Perugino's painting, in which the orthogonal lines are mapped out for us in the form of the tiling. Look at Paolo Uccello's The Hunt in the Forest of the 1460s: click here (external link; Web Gallery of Art). where a strong perspective scheme shapes the painting, yet the orthogonals are hidden. Try and identify the vanishing point (you might find it helpful to use a piece of paper, and sketch the orthogonal lines. Apart from the apparent relative size of objects, an important effect of perspective, which was again explored in the Italian Renaissance, is that of foreshortening. Foreshortening is the effect of perspective on a single object in space: so that parts of an object closest to us appear larger. This leads to sometimes quite striking effects, such as when an object appears to protrude out of the painting plane towards us. An example of the way in which foreshortening is worked out is in Leonardo da Vinci's Perspective Study for the Adoration of the Magi (1481-82): click here (external link; Dartmouth College). This study shows Leonardo working out how to situate objects within space according to their relative size, as well as through foreshortening. There are extremely useful diagrams showing the ways in which perspective affects objects at different angles to the picture plane, in the edition of Leon Battista Alberti's Treatise on Painting, ed. by Martin Kemp (London: Penguin, 1991). The use of foreshortening in the depiction of individual objects makes the objects appear more three-dimensional: this enhances their plasticity, a concept we shall explore in Unit 4. Aerial perspective refers to techniques which enable an artist to convey how far away areas in the extreme distance are by manipulating colour, and light and shade. 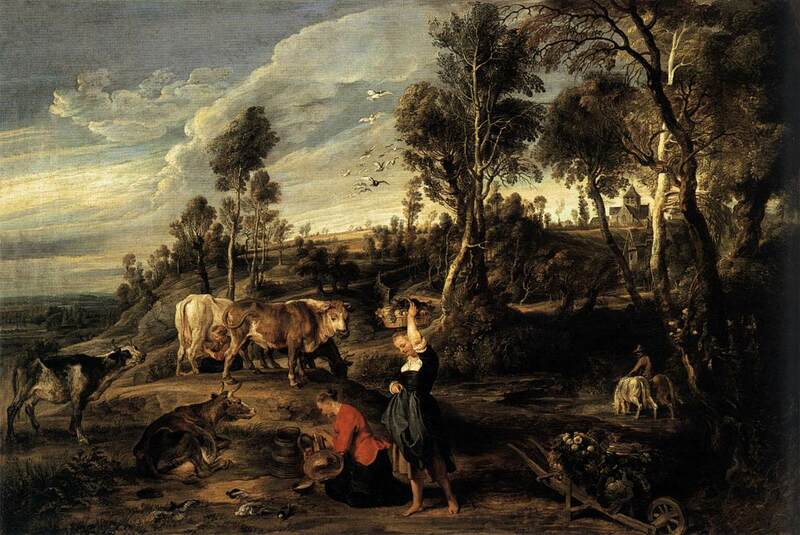 Look at these two examples: Leonardo da Vinci's Mona Lisa (1503-06): click here (external link; Web Gallery of Art); and Rubens, Farm at Laken (1617-18): click here (external link; Web Gallery of Art). In each case, the artist has manipulated colour, light and shade to convey distance. Can you identify what those techniques are? Empirical perspective refers to the ways in which artists (especially, although not exclusively, in the fourteenth century in Italy) experimented with effects of perspective, without applying the consistent rules of later linear perspective. The term "empirical perspective", frequently used by art historians, implies a fairly ad hoc approach: rather than using a scientific, uniformly applied method, the artist has used a variety of means, not necessarily consistently, to suggest space. 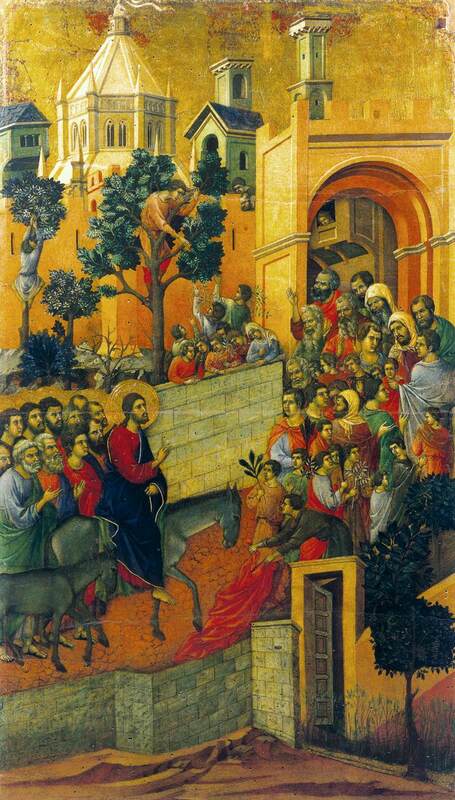 Consider this work by Duccio, Christ entering Jerusalem, in the Maestà (1308-11): click here (external link; Web Gallery of Art). (We looked at a different panel of this same work in Unit 2.) By what means does Duccio give an impression of space? Clearly an important aspect of perspective is that it requires a particular viewpoint. I have already hinted that viewpoint is a particularly important aspect of perspective: for linear perspective to work, the vanishing point needs to be on a horizon line which is more or less at eye level. In various ways, artists have exploited this. 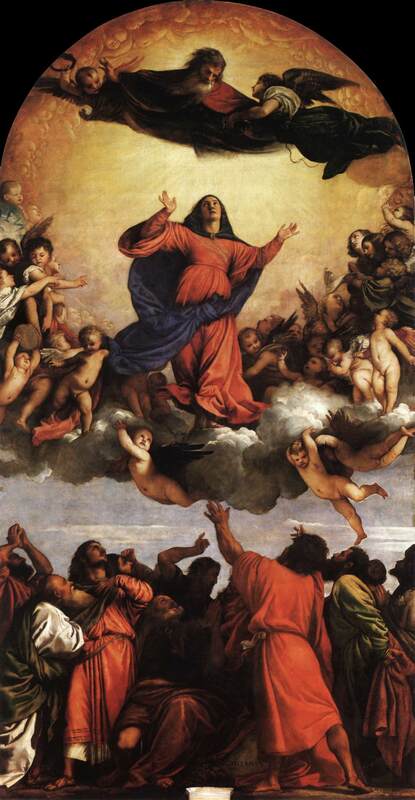 One example which demonstrates the importance of viewpoint is Titian's Assumption of the Virgin (1516-18). I never really liked this painting when I saw it in reproductions, as here (external link; Web Gallery of Art) . It looks a bit clumsy and awkward. It was only when I saw it on site, in the Frari in Venice, that it made sense: when you look at it from a fairly low viewpoint, as in this photo, the Virgin seems to be moving upwards, into the distance. This reminds us just how important it is to be aware, when we are looking at works of art, that where they are shown, and the viewpoint from which you see them, are of fundamental importance. Although perspective came to be a dominant and important technique in painting, the absence of a strict perspective-based scheme has been used to powerful effect. First of all, it is important to recognize that when we look at paintings produced before the development of linear perspective , for instance in the Middle Ages, we must not view the absence of perspective as a lack or defect, but instead take the paintings on their own terms. 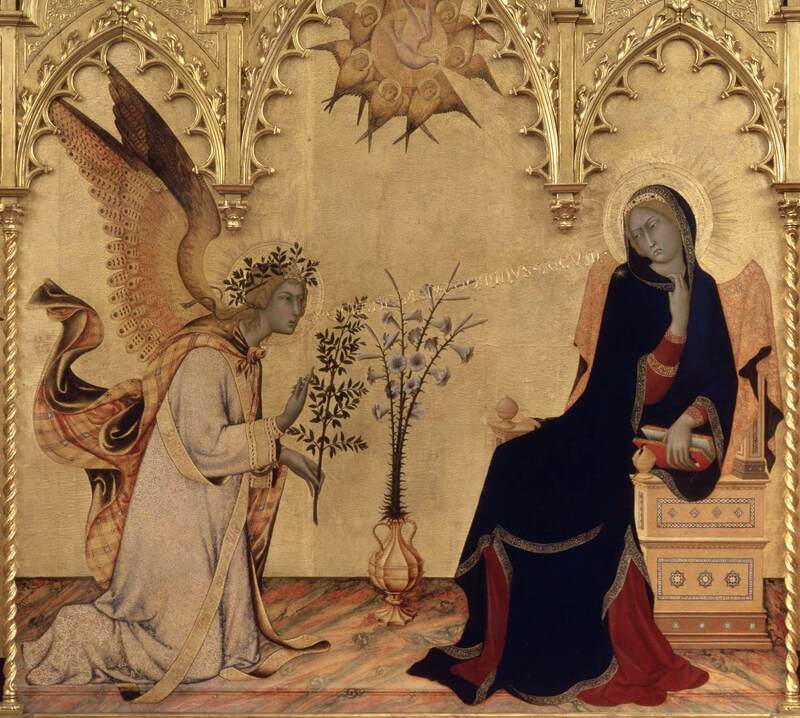 Look at this painting by Simone Martini and Lippo Memmi, The Annunciation with Saints Ansano and Massima (1333), for example: click here (external link; Web Gallery of Art). In what ways might the lack of perspective actually enhance the painting? Even in the Renaissance, at a time we tend to imagine painting as being dominated by perspective, some artists were exploring the effects of leaving perspective out. 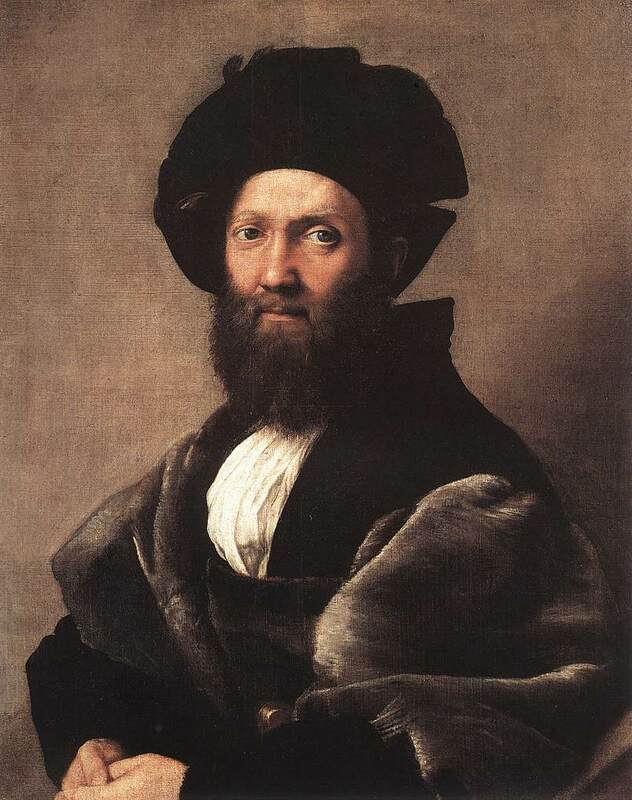 Look at Raphael's portrait of Castiglione (1514-15): click here (external link; Web Gallery of Art). In what ways does the absence of perspective enhance the painting? Look at Braque's Billiard Table (1945): click here (external link; Tate Modern). In what ways does it resist linear perspective? For the most widely read account of linear perspective in the Renaissance, see Leon Battista Alberti, Treatise on Painting, ed. By Martin Kemp (London: Penguin, 1991); this edition also includes some useful diagrams illustrating the principles of perspective. For more on Georges Braque, the catalogue of the exhibition Georges Braque: The Late Works, held in London in 1997, contains some excellent reproductions (John Golding, Sophie Bowness, and Isabelle Monod-Fontaine, Braque: the late works (London: Royal Academy of Arts, 1997). An excellent introduction to Raphael is Roger Jones and Nicholas Penny, Raphael (New Haven and London: Yale University Press, 1983). An excellent book on Rubens is Kristin Lohse Belkin, Rubens (London: Phaidon, 1998). Has the artist employed linear, aerial or multiple viewpoint perspective, or a combination of these? Why? Is there a distinct vanishing point? At what level is the spectator's viewpoint? Can you spot the orthogonals running through the painting? Is their evidence of foreshortening? Has the painting employed over means to suggest space - eg overlapping objects?